Treading in the Deep End | Travel. Philosophy. Water Polo. Life. Travel. Philosophy. Water Polo. Life. “Enhancement” project using Photoshop for my photography class. This is the castle of Volterra, Italy, which is actually currently a prison. I visited in November 2013. My friend wanted to see it due to the town’s relation to the Twilight novels. In Nimes, we first visited the Roman arena. After, we wandered through some small streets on our way to the only completely preserved Roman temple, the Maison Carrée. We came upon it almost by surprise, as the small streets opened into a wide Plaza with the temple planted in the middle of it. We made a circle around the temple, and my friend pointed out details I might otherwise not have noticed not having been a classics major. We entered the temple, but I was disappointed to find that you couldn’t actually see any of the inside. It had been turned into a theater where they present a 3D video of the history of the area. 3D is difficult for me to watch, and being in the darkened theater only made me sleepy as I was tired from driving and our late arrival/early rising. The part I enjoyed most of the video was that we could see what the temple would have looked like on the inside had we visited in the past. Twelve days and almost 2500km later, I have arrived back in Florence. I’m in the lounge at the top of the Hilton Metropole, feet up, looking out the window towards the Duomo where the last of the daylight is hitting it’s western side. As I watch, a little parakeet jumps out of the bushes and looks around nervously. I have just completed a road trip from Barcelona to Florence, with sidetrips to Lake Como and Rome, in my old 1999 Peugot 106. I’ve driven for probably 40 hours in the course of this adventure. Quite a feat. How do I feel? Relaxed. Tired. Accomplished. And…a bit lonely. I’ve spent the last eight days with one of my good friends from high school. Her flight from Rome to home was early this morning. Almost immediately upon returning to the hotel, I could feel a hole where she had been. It is difficult to spend so much time with someone you know well and then return to your normal existence. It is the same feeling I have everytime a water polo tournament ends. Yesterday, my friend and I took the A1 from Florence to Rome. While it spends a lot of time in the valley, it closes down to a two lane road and winds through the hills right before it drops down into Rome. Throughout this road trip, I didn’t feel comfortable driving my car more than 100 km/hr. The speed limit on the Autostrade in Italy? 130 km/hr. It isn’t so bad when you are driving in the valleys, where the cars are spread out and there are often three lanes, but in that last leg to Rome? Not so fun. There are always semis, but in that section they tend to pile up. They don’t go much faster than I am comfortable going, so it is easy to cruise behind them, or pass them when they are going a bit slower than I want to go. This easily allows everyone else to pass us on the left. In the hills, though, I couldn’t easily pass the trucks. Not only was it difficult for my car to speed up around them going uphill, in the left lane there was an almost never-ending line of cars speeding past us. Getting in front of an Italian driver who wants to go much faster than you is never a good idea. The turns are tight and the barricades tall. Semis in front and in back of you and cars wizzing by the left. Passing us were Audi after Audi, the Alfa-Romeo Giulietta (the only Alfa-Romeo we saw), and many other cars (VWs, Fiats, Range Rovers, Citroens), but none nearly as old as my car. It’s as if I shouldn’t have been allowed to drive there. Next time, however, I’ll be in an Audi or a Mercedes or even a Lambourghini, and I’ll get to experience the fun of driving in the midst of all that confinement. This is the first post in a planned series. I’ve tried to take pictures of every pool I have played in in Europe. Most recently I traveled with the team in Florence, N.G.M. Firenze, to Rapallo on the Ligurian coast (south of Genova). There we played two games, the first against Plebiscito Padova and the second against ASD Rapallo. Although Rapallo has many players from the Italian national team and won the league last year, we played better against them. It is possible that we were finally warm, and/or it was because they were missing their starting goalie. As for the other pools, in 2009 I helped coach/tagged along on on a high school boys’ water polo trip, where we played at Camogli. At that time Rari Nantes Camogli was in the A2 division and was coached by Ricardo Azevedo. We also visited the pool at Recco, which is home to one of the best men’s team ever, Pro Recco. They have won the Italian League twenty seven times and the LEN cup seven. On our way to Florence, we hiked the first part of Cinque Terre, Monterosso al Mare to Vernazza. In Vernazza, we played an informal game against their local club in the waters of the harbor. Later in 2009, I spent a week in Nervi (ASD Sportiva Nervi) training with their team. At that time they were coached by Massimiliano Ferretti, who won a gold medal in the ’92 Olympics in Barcelona. Last year I traveled to Bogliasco to tryout with Rari Nantes Bogliasco. There are, of course, other pools and teams in the area. These include Savona, Sori, and Imperia. Always more places to go and pools to play in! After riding on Sunday (read about it here), I needed something to eat. As it was Sunday, the only supermarket open was the huge Coop, and it had already closed. I decided to drive around and see what else was available. I ended up deciding to continue all the way to Arezzo. Now, I studied abroad in Florence for a month in 2007, and I took a few trips outside the city one weekend. Two friends and I went to two smaller towns on Saturday and two more on Sunday. I could tell you three of the four towns we went to (Pistoia, Cortona, Lucca) and could remember two well enough (Lucca because I went a second time two years later and Pistoia for god knows what reason). But I couldn’t say which of the other memories I had was of Cortona, or even what city the last memory was of. Well, I quickly found out that the last city I had visited was Arezzo. So, here I was again, this time arriving by car. It was my lucky day! To arrive in a city I had been to before but this time armed with a much better camera and improved photography skills. I think it has been about eight years since I’ve done any kind of real horseback riding. This is strange for me, since from the age of 5 to 20, I rode at least four or five times a week (except during water polo season). I knew when I entered high school that I would put horseback riding secondary to water polo until I was finished with water polo, but I have always considered myself a horseback rider, even through all the years I haven’t done it. The break started because I decided to retire my horse. She was getting older and more injury prone. My mom had sold her horse and would no longer be at the barn to look after mine. It was a tough decision because I knew that it would mean my horseback riding career would be put on hold for the foreseeable future. However, it was also an easy decision because I knew it was the best thing for my horse. At my level, it is difficult to ride without owning your own horse. Of couse, I could always “school” other people’s horses, as I’d done for many years, but there is a limit to what you are able to do and the amount of time you can spend with that horse. And owning a horse requires a commitment that I did not have time to give. I have avoided riding for the last eight years, due to both logistics and grief for my horse who was put down in 2009. But recently I’ve decided that it may be the moment to return to an old love of mine, even if only in a small way. Oddly enough, I’ve never rented a car while traveling. Of course, I’ve had to rent a car when visiting San Francisco or other places like that, but I wouldn’t consider that traveling. Not only am I just visiting a place I’ve already been, it is still in the country. A little over a year ago I went to Santiago de Compostela, and what I really wanted to do was get in the Atlantic Ocean. However, there was no way I could visit using public transportation and still make it back in time for my evening flight. The hotel suggested that I rent a car, but for some reason I felt it was out of the question. For my own unknown motives, I didn’t get to do something I wanted to do. I vowed next time I was going to rent a car. For all that I’ve travelled in Italy, I was nervous to rent a car. I’ve driven in Spain, which isn’t all that different, and I’ve always been excited to try my hand at driving with the crazy Italians. What was there to stop me? It sounded like fun. So, I did it. (Read about the car here). It took me way longer than it should have to get to the hotel. Neither the GPS nor my cell phone was working properly, and I couldn’t figure out exactly where the hotel was. Eventually, I got the electronics working, and, as it turns out, if I had gone 50m more from where I originally turned around, I would have found the hotel. Ah well. The hotel’s name is Tenuta Il Burchio. It spreads across a one-lane-but-made-for-two-cars street. On one side is the hotel, a white-washed building with wooden window frames and an old tile roof. The other side has an extra building (one room, sided on three sides by glass windows) surrounded by a brick patio and tables. This is where breakfast is held. Behind it, reached by walking along some pine trees, is the 15m pool. Behind the hedges bordering the pool is the stable. That, however, is a separate property from the hotel. I came to Florence two weeks ago with the goal to play on an Italian water polo team. I arrived on a Tuesday, but had about a week before practice started. I spent three days sightseeing in Florence, visiting the smaller things I had never seen (read about that here). By Friday, due to the heat and crowds, I decided to get out of the city. Recalling a place I visited with friends four years ago, I searched out a hotel that would be in the countryside. What I found wasn’t as remote, but it had it’s own charms. What sold me on the hotel, besides the pool, was the stable and the possibility to ride. So, I rented a car. I thought I was getting a Fiat Punto Evo, which seemed like a decently cool car. 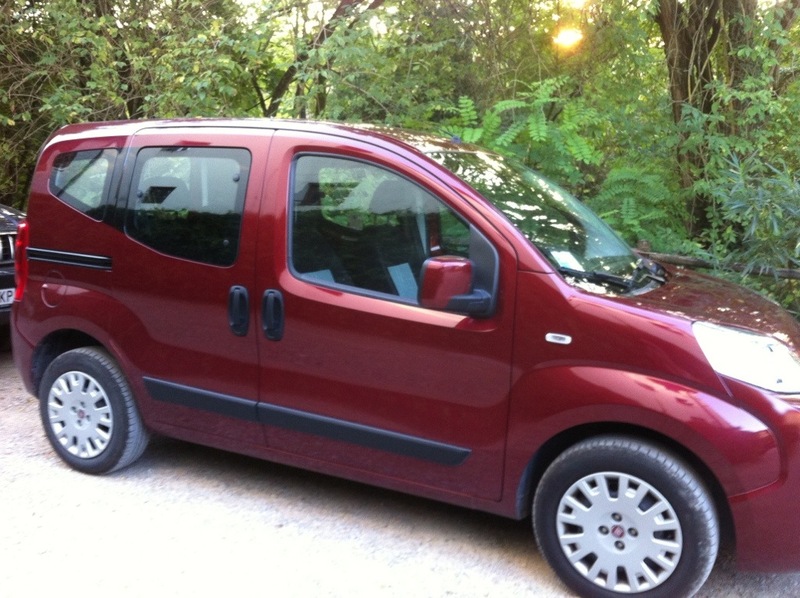 Instead I got the Fiat Cubo, which felt more like a mini work van. And was decidedly uncool. After watching the Cofradía del Silencio, I met with Isabel and we planned to go to see the “Capas Pardas.” This is another procession that she likes a lot but doesn’t actually enjoy watching. While beautiful, this procession moves at an incredibly slow pace. It begins at midnight and ends at probably four in the morning. Where we were, it took until 1am for them to arrive, and we didn’t bother to stay and watch them pass. It was too cold and we were still tired from Via Crucis. The full name of this procession is Hermandad de Penitencia del Santísimo Cristo del Amparo. This procession is very different from the others, which is what makes it special. The 150 cofrades wear a capucha (a regular hood) instead of the capirotes (the pointed hood). Their tunics and hoods are all of a brownish-grey color (parda), and the hoods are elaborately decorated in the style of Aliste, a nearby town. 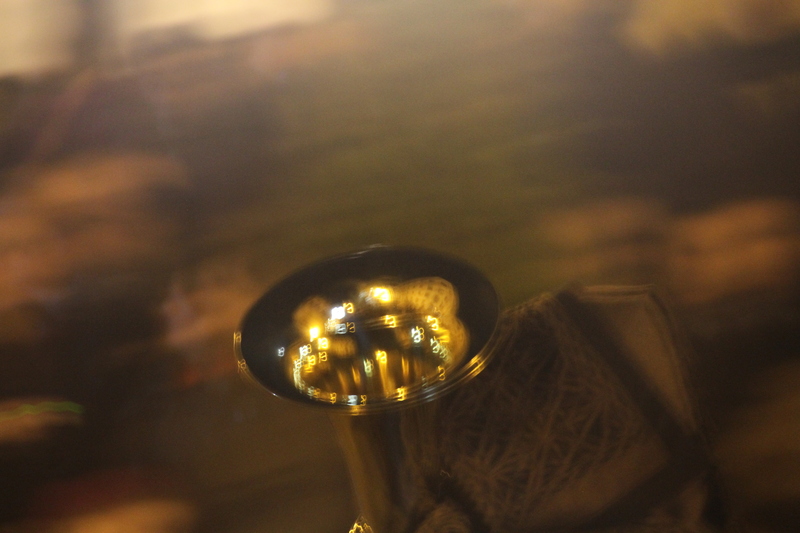 In other processions, a band will announce the arrival of the procession, but in the Capas Pardas, matracas (rattles) serve the same purpose. Each person goes very slowly, stopping after every few steps. They walk with their head down, carrying a lantern (farol) that illuminates only the middle of their body. As the procession was passing us in the Plaza San Ildefonso, the “Vía Crucis” were read. These are the fourteen stages of the story of Jesus carrying the cross. You can read about them (in Spanish) here. This procession only has one paso, called Cristo del Amparo. It is from the 17th century and the creator is unknown. At the end of the procession, they sing “Miserere castellano” in the Plaza San Claudio. The next morning (Thursday), I caught the middle part of this procession as it passed through the Plaza Mayor. Isa’s apartment faces the plaza, so it makes it very convenient to watch the processions when you have just woken up. The procession started at 10.30am; however, it wasn’t until 12.30, when the music was at its loudest, that I woke up and went downstairs and out onto the balcony to take a few photos. As an example of how small Zamora is, a friend of Isa’s dad saw me on the balcony and called to tell her father that his American guest was on the balcony in a t-shirt (the horrors!). I was also barefoot, but he couldn’t see that. Objectively it was a bit cold, but I couldn’t feel it at all. (I hate when people tell me to dress warmer when I’m not cold). This procession is known for the imagen of the Virgin Mary crying for Jesus. The cofrades are all men. Following the paso are the only women, wearing all black with a peineta espanola (the comb holding up the veil). They are called damas de luto (women in mourning) and dress as they did for funerals in ages past. The lace veil that they wear is called mantilla and it means both lace and shawl in English. In reference to this procession, the booklet on Zamora’s Semana Santa also says the hood is called caperuz. This is the most common name in Zamora. My favorite thing about the kid cofrades is that they don’t look like children. They seem to only be miniature cofrades. We took two trips to Salamanca, one on Holy Thursday and the other on the Tuesday after Easter. The first trip was to visit the various sites. We were taken by Isa’s father, Don Mariano, because he had studied Law there and could show us the city. Of course, the city that he knew is not the same. The “hot spots” and places to be have changed multiple times over the years. One exception, at least, is Mesón Cervantes where Mariano took us for lunch. The second time only Isa and I went. We wanted to do some shopping as the stores had all been closed the last time. Isa took me to La Sureña, which is a bar favored by students in Madrid because of its cheap tapas and beer. Salamanca is a “college town” with the oldest University in Spain. Many Spaniards and foreigners come to Salamanca to study, and therefore there is always something do and somewhere to go even though it is a small town. Many famous people have lived there, including Nebrija, who wrote the first Spanish grammar book; Christopher Columbus, while he was planning his trip to America; Fray Luis de Leon, who translated the Bible into Castellano; and Miguel de Cervantes, who studied in the University. Too, many famous Spanish novels have been set in the city, including La Celestina, written by Fernando de Rojas in 1499. The story tells of Calisto and Melibea, whose courtly love affair goes wrong due to the machinations of the matchmaker Celestina. Don Mariano took us to El Patio de Calisto y Melibea. This is the actual garden where the two lovers meet in the novel. It is still a garden for lovers, who come to be together, write love notes on the walls, and fasten locks to the well to symbolize the “foreverness” of their love. On the back side of the University is a facade that is very elaborately carved. Somewhere on the wall is a frog sitting on a skull. The legend is that if you find the frog, you will graduate. Que dice: La leyenda que si encontrabas la rana, aprobarias la carrera. Isa showed me where the frog was. I guess I’m not going to graduate! On our second pass through Salamanca, I drove Isa’s car there and back. Don Mariano had to work and we wanted to get out of Zamora and the house since we had been inside way too much due to rain. We made some purchases, including earrings typical of Salamanca and a book of practice exams for the B2 level for me (Isa is going to be my tutor), and we each bought some clothing at Bimba & Lola, another successful Spanish brand of clothing (the others being Zara, Custo, Desigual, etc). Isa needs to open a Bimba & Lola store in Los Angeles and share the wealth with the Americans!